Equitas Walkin Drive In Mumbai for graduate freshers on 7th September 2018. 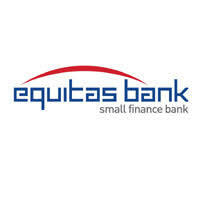 Candidates who had done graduation in relevant stream with 1 to 6 years experience in any industry can come and utilize this chance to build a new career with Equitas Small Finance Bank Ltd company. Students who will get select in these Equitas latest job openings they can get INR 70,000 – 2,00,000 P.A. In order to crack this job in the Equitas company as Sales Executive, Officer Role candidate should complete all account opening related processes accurately. Moreover, people should maintain continuous communication with customers on the status of their account opening process. Job aspirants who meet all the job requirements those people are eligible to appear for the Equitas Walkin Drive for Sales Team. 1.4 How To Apply For Equitas Walkin Drive? The company Equitas Small Finance Bank Ltd have openings for Sales team for multiple branches in Jaipur. The details for a full detailed description of the job role is provided below. Build a reference network from newly signed up customers for potential leads. Should schedule meetings with potential liabilities customers and understand their requirement. Identify potential catchment areas of potential retail liabilities customers for Equitas Bank. After that presenting them with the most suitable products and explaining the features/ benefits. Communicate clearly to customers on the requirements for various types of products & services, for example, charges for maintaining a locker, minimum balance to be maintained, etc., and on the documents required to be submitted to the bank with Equitas. Frequently communicate with newly signed up customers and assist them with additional products and services based on their requirements, for example, relevant loan products, investment products, etc. People should build a database of customer leads through references and also opening stalls in areas where there are a higher number of footfalls like apartment complexes, shopping areas, etc., door to door visits, distribution of pamphlets, etc. Candidate should complete all account opening related processes accurately so that the customer experience is enhanced and also forms the foundation of a long relationship with the bank. Maintain continuous communication with customers on the status of their account opening process. Ensure that all customer documents are verified with originals and are handled with care and confidentiality. Regularly update Daily Sales Reports and discuss the plans, action items, progress with the supervisor. Equitas Small Finance Bank is a small finance bank founded in 2007 by Equitas as a microfinance lender. Headquarters in Chennai, India. The bank Equitas planned to build a network of 412 branches located in 11 Indian states by the end of the fiscal year 2016-2017. With the effect from 4th February 2017, Equitas became a scheduled bank. After that receiving a license from the Reserve Bank of India on 30 June 2016, the company Equitas began banking operations on 5 September 2016 as a subsidiary of holding company. The Equitas Small Finance Bank Ltd is heavily committed to technology, with 83% of transactions occurring online as of July 2017. How To Apply For Equitas Walkin Drive? To get instant updates on Equitas Walkin Drive to keep on visiting our web portal Freshersnow.com.